Thanksgiving is only 11 days away! Erik and I usually host Friendsgiving at our house so I started planning quite early. I decided this year I wanted to dress up our table a little more. Instead of a tablecloth I set down brown kraft paper. I like the natural look it gives. In the middle of the table I added leather leaf for a green base. 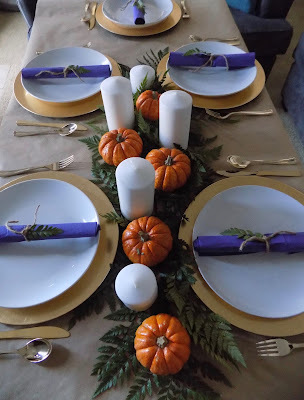 On top I staggered tall and short white candles and small pumpkins to complete the centerpiece. For the table settings I started with a gold table charger topped with a white plate. I really wanted gold silverware to match. Since we didn't have the cash to drop on gold utensils for each person I went with plastic gold silverware and it did the trick! To help the plates feel a little less naked and to add a pop of color I added a rolled purple napkin. I tied it with a piece of twine and added in leather leaf to match the table. I love how this look turned out! The warm brown, orange and gold make it feel like fall while the green and purple add in some variety. What are your plans for Thanksgiving?